There are two projects at the moment that have been going very steady and strong in ScribeSlice that deserve some support and recognition. This discussion has been started to discuss and review one of them. "The idea was for it to be part of a series of short stories, perhaps a couple of those and for the longer ones, they'd be novellas. As I finally finish adding the final few parts to this here, I will then add the next short story that comes after it. There are four in total. I am following the same kind of format as Stephen King's Hearts in Atlantis collection of stories, which has two novellas and three short stories. This is the first novella, the next will be the second, and then the final three will be much shorter. Also similar to King's collection is my setting all of these stories in the same universe, but in different time frames (this might be a time-travel-focused story but the next one starts in 1992 and no one time-travels) and every character has a connection to each other in each story." Congratulating Justin for a successful project completion. The discussion is now open here for the reviews and opinions about the story(now categorized in the book section). 1 - 'Sunglasses, Time-Travel, & Iced-Tea' - First novella, first written. 2 - 'Dominick & Leah' - Second novella, second written. 3. 'Let the Good Times Roll' - third short story, fourth written. 4. 'Is it Like Today' - Fourth novella, third written (in between Dominick and Leah actually). 'Dominick and Leah' and 'Let the Good Times Roll' are kind of like fringe stories - different characters, but with connections to the main ones of the other stories. The first and last stories, the iced-tea one and the 'like today' one focus on the same main characters - though the last story increases the roles of certain minor characters in the iced-tea one and takes place many years in the future from the first story. In view of the above plan, I have extended this discussion now to add the other books written by Justin in here too. The second book from Justin Campbell, set in the same universe as 'Sunglasses, Time-Travel, & Iced-Tea'. Note from the Author: "This is the second story in the first book's universe (i.e., Donald's Foods, Normorbrook, etc.) and as I post more chapters, the character's connections to the characters of the previous story will become apparent." The book is complete now and can be discussed on this page. A short story by Justin Campbell set in 1985, in the same universe as the first one and can be read HERE. The final book that neatly wraps us the three novellas by Justin. It can be read on the links and can be discussed in its entirity in this discussion. Appendix A contains a Chronology of the novellas and can be read HERE. 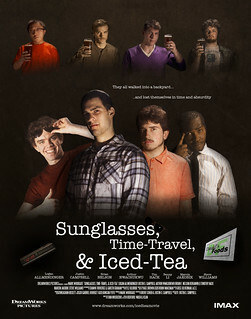 Appendix B discusses the major characters of 'Sunglasses, Time-Travel & Iced Tea' and can be read HERE.